Haewon Shin was one of the three artists invited to propose a spatial organization and design of what was formally known as the Álvaro Siza Hall, and is now called the Anyang Pavilion. The pavilion was to function as the hub for the 4th APAP, and host a range of activities and participants, including members of the public. Accommodating a wide range of activities is the essence of the project, which makes use of movable partitions, furniture and other elements to create a varied three dimensional space that embraces leisure and practicality simultaneously. 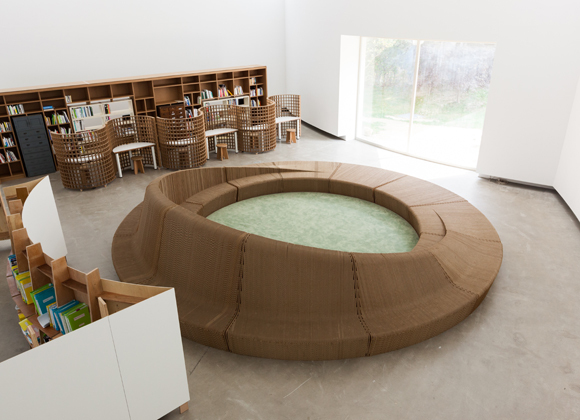 Cardboard was chosen as the main construction material (for the round bench, bookshelf, moveable partitions and chairs) in part as a reflection of the 3 year project duration, in part for its sound absorbing qualities and its recyclability. The flexibility of the space was further enhanced by adjusting Artist Mikyung Lee’s screen and inserting the furniture from the old Yuyu site nearby. 신혜원은 공간의 조직화 프로젝트를 위해서 초대받은 세 명의 아티스트 중 한 명으로, 현재는 안양 파빌리온이라고 불리는 알바로 시자 홀을 디자인하였다. 파빌리온은 제4회 안양공공예술 프로젝트를 위한 허브로 역할을 할 예정이었으며, 다양한 활동과 대중을 포함한 참가자들을 위한 초대 공간이 될 예정이다. 이번 프로젝트의 핵심은 넓은 범주의 활동을 수용하는 것이다. 따라서 움직일 수 있는 칸막이, 가구를 비롯한 요소들을 이용하여 다양한 활동이 가능한 3차원 공간을 구현하고자 한다. 3년이라는 프로젝트 기간 동안, 이러한 목표들을 투영하기 위해 주된 건축 재료(원형 벤치, 책장, 움직일 수 있는 칸막이와 의자에 사용될)로 카드보드(cardboard:특수강화골판지)를 선택하였다. 카드보드는 흡음성이 뛰어날 뿐 아니라 재활용이 가능하다. 공간의 유연성은 예술가 이미경의 스크린과 근처의 오랜 유유산업 공장으로부터 가져온 가구를 배치하면서 더욱 향상되었다.